Protests against what is being called Viktor Orban’s “slave [labour] law” in Hungary are turning into a questioning of his entire regime. For nearly 2 weeks now, Hungarians have been taking to the streets in Budapest and in other cities across the country, protesting labour law reforms that will allow bosses to force workers to work up to 400 extra hours a year. For many observers, this movement is unlike others the country has experienced. We interviewed Gergő Varga, editor of Tett, hosted by Mérce.hu. Demonstrators have denounced Orban’s “slave [labour] law” as completely favorable to the bosses. Can you explain the law? The slave labour law was quite clearly written to appeal to German industrial interests, raising the maximum amount of overtime per year to 400 hours and extending the payment window up to 36 months. This could also be seen as a move to anticipate a crisis and to side with companies by making them more financially resilient if trouble comes. The other law that sparked protests seeks to establish so-called ‘administrative courts,’ which would give Fidesz-appointed judges final decision-making power on a range of public spending and transparency issues. However, this wasn’t framed in a meaningful way from the viewpoint of the popular classes – that it is designed to protect Fidesz’s capital interests – and is presented as just another nail in the coffin of the rule of law and liberal democracy. Even if Hungarian industry has benefited from investments made by auto-manufacturing multinationals, and many factories have opened in the country, throughout Central and Europe (as in Hungary) there is still a large emigration creating labor shortages. Can this explain this new law? Yes, this is quite clearly a trend, however it is not covered in a widespread way in mainstream Hungarian media, so there is no meaningful public discussion of these issues. Ukraine has already become a key source of labour migrants to Hungary (who are seen as more ‘acceptable,’ in contrast to immigrants from Muslim-majority countries, according to hegemonic right-wing discourses). For the government, the only way to keep up ‘competitiveness’ via cheap labor is to further cut existing protections. Interestingly, a lot of people who are not protected by union contracts already work insane hours, and are thus ‘falling out’ of the debtates over the labour law as no meaningful actor has expressed a strong stance on the issue. The unions are slow to come up with large organized actions, though it should be noted that at least some of them are trying their best. Is the “slave labour law” the only reason for the protests? I think the passing of these laws and the way they were passed, in spite of attempted obstruction by the opposition was the straw that broke the camel’s back. The discussion is no longer about the laws individually, but a huge coalition of anger and hate towards the Orban regime has produced some bizarre protest scenes, initially with the so far unknown antifa pushing the cops around next to literal neo-nazis. Talk about shifting priorities! 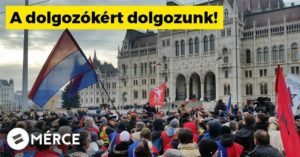 The media is saying that the protests are organized by a large opposition, from the Green Party to the far-right Jobbik, along with citizen and youth organizations. Can such an ‘alliance’ hold? This is the most concerning part actually. Initially the protests were spearheaded by a new coalition, started off by university students forming a student union in solidarity with the workers, protesting together and trying to form a systemic critique of Orbán’s regime by building on a material, interest-based platform. However, the opposition parties (spearheaded by the extra parliamentary, Macron-allied Momentum!) have swooped in with street radicalisation actions, completely dominating the discourse and shifting the focus from material needs of the working class to a general resentment against Orbán’s regime. The demands of joining the EU level prosecutors office are back on the table, there were nods of solidarity to the police workers (!) while expressing non-violence, denouncing previous “violent” protesters (those who spontaneously went out in the December cold for three straight nights to protest these laws, and were violent enough to set some trashcans on fire and throw toilet paper at the riot cops… are now getting handed to the police by the protest organizers!). Now the focus is on the state media, which is little more than a propaganda outlet for Fidesz, as opposition party members decided to try to get on air and got thrown out by security goons. The end result is that they were welcomed to join the protest against the labour law, and managed to completely turn the media narrative around (both government and opposition) in order NOT to talk about the labour law. So whoever this alliance is for, it is highly doubted among the left that they are offering anything besides token value to the working class or the youth. But Jobbik is also influential, no? How can you explain that some liberal parties are accepting to march with them ? Can they politically capitalize on the movement? No, they are marginal, even though they can mobilize their supporters, or rather its their supporters mobilizing the party. There are a lot of Jobbik supporters out, but I guess that’s a testament to how much the party has appropriate the left-wing populist discourse in terms of the economy. During protests in Budapest some demonstrators have been wearing yellow vests; can we say that the movement of Yellow Vests in France has influenced Hungary’s protesters? We expected there to be yellow vests, and we got white hats, instead as the opposition MPs denounced the non-existent ‘violence,’ took the place of unionized workers behind the main union sign, and started talking about a popular anti-Orbán coalition. We’ll see how the situation develops, but the white hats, many of them from parties who voted for the anti-NGO laws, some of them more neoliberal than anybody else on the scope, others from the previous government that let a good portion of the country sink into debt slavery… these white hats held their speeches on a protest organized by the left, and while it was disheartening to hear them speak their empty lines and offer token resistance to the workers, they could not do or say anything about the entire crowd of some 30,000 people screaming in their faces calling for a general strike. For all they preach non-violence, they cannot fathom the idea of a strike! So the yellow vests will have to wait, for now. Some union leaders are talking about a strike against the law; do you think it is possible? Which sectors of workers are angrier with this “slave labour law”? A lot of unions have expressed interest in a strike, and there are some motorway blockades on the way. However, given the timing and their activity in the media, hopes are not high. Union membership is low, the strike funds are empty. The teachers and the Vasas (metalworkers) and the chemical workers seem to be the most radical (…in words and by their own measure), but they only today announced that they will start organizing a general strike if the President (János Áder) signs the law. I thought they had a bit more plans in advance. Union politics are also an issue, a lot of union leadership are known to be in cahoots with Fidesz, and their room to strike and mobilize is very low due to previous rounds of weakening labour rights. But at least for now they seem to be moving in a more political direction, whereas in the last eight years all union activity was strictly framed as “apolitical”. Just a friendly word of advice for the LeftEast readers: just because the liberals / centrists have visibility and media prowess, build your power up first or risk getting coopted. We might just be paying for a naive error very dearly, but it’s early to say how the situation is going to develop.